© 1999 by The Trustees of Indiana University. Used with the permission of Indiana University Press. All rights reserved. Personal is a word used a good deal in discussion of David Jones's painted inscriptions. Indeed, it is a word used by Jones himself: in a letter to Nicolete Gray, editor of the fullest volume of reproductions of these works, Jones writes, "I do regard them as essentially 'amateur' and 'personal.'" 2 And Gray rightly remarks that the style of some of the inscriptions has the personality of the intended recipient in mind, as, for example, the lighter and more decorative inscriptions "made for a child." 3 But the word can be misleading. To take a tiny and personal example: in a letter to me, Jones sent thanks to me and my wife, decorating her name with leaves and flowers. It was a kind of tribute and a kind of joke, of course. What had impelled him to do it was probably more personal. Her name is Pamela, etymologically "all sweetness." Thus the flowers and leaves are apt. In fact, he knew her as "Pam," but the etymology would be lost in the abbreviated form. Now he was in no position to know whether she knew the etymology of the name; but, to him personally, the name becomes both word and picture and is therefore fitting. Before examining the inscriptions, it is important to set them in the more general context of Jones's turn of mind. He opens the Preface to The Anathemata with a quotation from Nennius, "I have made a heap of all that I could find." 4 Nennius, writing his History of the Britons (that is, the Welsh) circa 800CE, feared that historical and cultural matters dear to him might be lost if he did not record them for posterity. The result is a concatenation of fact and myth whose juxtaposition appealed to a connective mind like that of David Jones: the Six Ages of the World; the inhabitants and invaders of Britain (the word used here to signify the British Isles, not just Wales); the Life of St Patrick; Arthur's battles; genealogies of Anglian kings; the cities of Britain; the Marvels of Britain (including a stone on Anglesey that walks at night over the valley of Citheinn). Nennius, from Breconshire, but writing in Latin, included his personal allegiances in his matter of history and mythology. David Jones was drawn to writers who made such eclectic links. His was a mind for mosaic, which pictured the history of mankind as an intricate pattern, a pattern of politics, of the impulse for artistic creation, of the sense of the numinous, of languages with their individual overtones and cultures, and of words with their connotations and their etymologies and semantic changes, which often reflect a cultural history in miniature, like looking at a section of an archaeological excavation. For just that reason he was fascinated by the works of William Camden, who, some eight hundred years later than Nennius, made a heap of all that he found. His most famous work, Remains Concerning Britain, was published in 1605. Camden had been educated at Oxford and became the headmaster of Westminster School. He was a fine Classical scholar. He was persuaded by the great geographer Abraham Ortelius to help him in his survey of England. This ideally suited Camden, who took the opportunity to record remarkable antiquities of the areas that he visited and recognized the necessity of understanding place-names. This, in turn, led him to write a well-informed chapter on the history of the languages of Britain, notably of England—although he is also well aware of Welsh, making frequent references to that language. He made, in addition, a whole heap of apparently random observations, which were for him were collectively "remains" of Britain: chapters on the meanings of Christian names of men and women, surnames, proverbs, epitaphs, heraldic bearings, and so on. May I ask you one more question about what I take to be a quotation in one of David Jones' inscriptions? (My book shd have gone to press long ago but has been held up by a take-over bid—the new editor has pointed out that I have not traced the origin of this phrase) it is "so now let grey-eyed Sisley be tutelary." Who would Sisley be? The inscription was made for Sabina Margaret Ann Prudence Maudlin Caecilia Grisewood. . . . It was made in 1956 & the main text is "Accendat in nobis Dominus ignem sui amoris et flammam aeternae caritatis," from the Offertory of the "Tridentine" Mass. The phrase follows the names & both run round the Latin as a sort of border. The editor wondered whether it referred to Sisley the painter so clearly some explanation is required. I had assumed it was an archaic spelling of Cicely but why "grey-eyed"? I shall be most grateful for your help. Nicolete Gray was quite right in her assumption that Sisley was an old form of Cicely. On 20 January 1981, I replied to Nicolete Gray, but I discovered that, when the book was produced, it contained only a brief reference to the information that I had sent. No doubt this was due partly to the closeness to the eventual (albeit delayed) publication, and partly because I had supplied more information than was necessary for the purpose. In the event, what she wrote in the note on Plate 40 was simply, "Sisley is an old English form of Caecilia, 'grey-eyed.' Grey-eyed would certainly have recalled Athene, tutelary goddess of Athens, to the artist." This left me with Nicolete Gray's query about "tutelary." The natural bent of David Jones's mind for association picked up the "grey-eyed" epithet and recognized it as the stock description of Athena's eyes in Homer, . 7 Athena's role as the tutelary goddess of Athens is discussed by Jones in, for example, a letter to William Hayward, a young admirer of his work who was seeking guidance on a passage from The Anathemata, a work published only four years before the painted inscription for Sabina Grisewood. 8 Thus, Gray's query about the connection between "grey-eyed" and Sisley the "tutelary" is answered. "As chaste and religious as a Sabine, who had their name from their worshipping of God." For Athena was first & foremost a tutelary figure of civilised things—cities, the arts, and also defence by battle. . . . So here is this dual, or rather many-sided, figure of The Maiden—the Parthenos, but, Promachos, "a foremost champion." In the Anathemata passage which Jones is explicating for Hayward, the ship being guided is Christianity making its way bit by bit northwards to Britain. The inscription is written for a girl, whose first name commemorates the Sabine virgin priestesses and who is protected by the maiden-goddess Athene, the preserver of culture. All of this surrounds a prayer that her heart will burn with the love of God. In the Litany of Loretto Our Lady is called Virgo Potens and Domus Aurea and Turris Eburnea so that in the text (94) "within her Maiden's chamber, tower of ivory in the gilded cella herself a house of gold" carries other significance as well as that of Athena. Virgo Potens and A[thena] Promachos more or less equate. As appeared 'bout bate-time of storm-height. Classical mythology and Christian mythos become in this inscription a seamless garment. It is a kind of Anathemata in miniature. Nicolete Gray says in her note on this inscription that, being made for a child, it is "altogether less serious than many of the finished pieces." I am inclined to think that it is one of the most complex, a microcosm of Jones's connective mind. we find a quotation from Chaucer's translation of part of Le Roman de la rose circling round the border, broken only by the name "Clarissa" in Greek lettering. The main text is a Latin quotation from Aquinas. The signature "Dafyð J a�i wnaeth" is Welsh, and means "David J[ones] made it," corresponding to the common Latin fecit' used with signatures in Renaissance art, and frequently by Jones himself in his inscriptions. 16 The date is in Roman numerals, MCMLVI. 17 The Old English crossed d ('eth') in "Dafyð" was, as Jones knew, not used in Welsh orthography, and it conceivably forms a further cultural link of a personal kind: "Dafyð" combines Welsh and English, reflecting Jones's own provenance. I suggest this tentatively, however, because elsewhere he uses the crossed d in Welsh words other than his own name, and (guided by a remark in Ben Jonson's English Grammar) he assumed that it exclusively represented the voiced form of the th fricative. 18 Then, in addition to the signature, if we focus on the main picture, we find three apparently disparate references distinguished by three languages: the Latin of the theologian Augustine; the French secular allegorist, Guillaume de Lorris, who wrote in the thirteenth century the earlier portion of Le Roman de la rose, appearing here in a Middle English translation; and the Latin name Clarissa, inscribed in Greek. Anglo-Saxon, Middle English, Latin, Welsh, Old French, Greek: the entire cultural inheritance of the British Isles is here in a profusion of hints and suggestions. Of high prys and of gret degre. As an arrow, of which I tolde. Like the arrow I mentioned. But as small candles, in our judgement. The Neo-Platonic Thomist philosophy wonderfully fuses with the secular French text. In any case, the distinction between the God of Love (=Cupid) and the God of Love (=the Christian God) is frequently ambiguous in medieval writing; and, from a Neo-Platonic view, earthly love and beauty are indeed reflections of divine love and beauty, albeit pale reflections, even as the light from a small candle is outshone by the light of the moon. Thomas Dilworth, writing about Jones's poetry aptly remarks: "The difficulty of understanding the unfamiliar references can be overcome. And the process is educational, since everything Jones refers to has historical or cultural significance...the allusions are essential to meaning and aesthetic effect. They are not mere borrowings from sources but generate a rich subtext that requires reading on more than one level." 22 The observation applies equally to these inscriptions. 1. 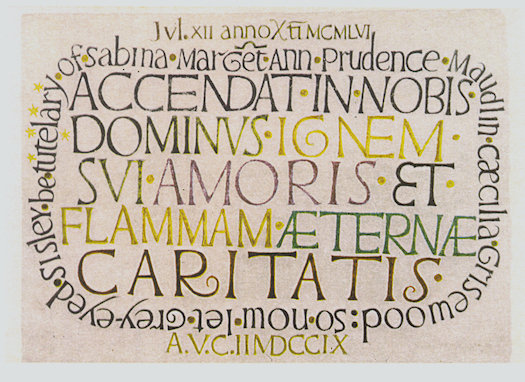 I am grateful to the trustees of the David Jones Estate for giving permission for the reproduction of these painted inscriptions. This paper was first presented as a lecture at the David Jones International Conference held in Pembroke College, Cambridge University, 18-20 September, 1998. 2. 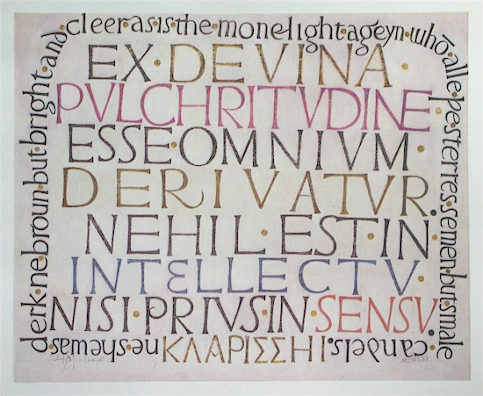 Nicolete Gray, The Painted Inscriptions of David Jones (London: Gordon Fraser, 1981), p.103. 3. Gray, Painted Inscriptions, p. 35, note on plate 40. 4. David Jones, The Anathemata (London, 1952), p. 9. 5. Huw Ceiriog Jones, ed., The Library of David Jones: A Catalogue (Aberystwyth: National Library of Wales, 1995). Jones had been given the Camden book in 1941. See William Camden, Remains Concerning Britain (London: John Russell Smith, 1870). There is a facsimile reprint, with an introduction by Leslie Dunkling (Trowbridge and Esher: EP Publishing, 1974). See pp. 101 and 107. 6. There is, in fact, no entry under "Caesilia" (spelled with an s at the center of the word); that is evidently a slip. A rather greater slip is that Caecilia is a gens, a tribe. Camden was probably thinking of the Latin caesius, a rare word, which means "bluish-grey" and is used only in describing the eyes. 7. As, for example, in Homer's Iliad, I.206. 8. See Colin Wilcockson, ed., David Jones: Letters to William Hayward (London: Agenda Editions, 1979), pp. 36-37. 9. Jones also used the Offertory passage in an engraving for the Ancient Mariner. 10. Latin Stella Maris="Star of the Sea." 11. For the link of five bright lights to aid navigation, see Anathemata, p. 141, where the crucifixion depiction of The Dream of the Rood is alluded to. See Ren� Hague's note on the line in A Commentary on the Anathemata (Wellingborough: Christopher Skelton, 1977), p.174. 12. For example, the last inscription in The Anathemata is a quotation from that poem. 13. OED, beacon, sb. 6: "A lighthouse or other conspicuous object placed upon the coast, or at sea, to warn vessels of danger or direct their course. Beowulf line 6301 [this is, in fact, an erroroneous transcription of line 3160] is the earliest reference given. 14. The letter is reproduced in black and white in Agenda, vol. XIV, No. 2 (Summer 1976, p.68), and also in color in David Jones: Letters to William Hayward (facing p. 58). 15. OED, beacon, sb.3b. The liturgical passage ("Accendat in nobis dominus ignem, etc.") is spoken as the priest passes the thurible, with its burning coals, to the deacon, so that the beacon-fire allusion is immanent. I am indebted to Robert Ombres, O.P., for this suggestion. 16. For example, in Gray, Painted Inscriptions, numbers 18, 42, 59, among others. 18. Nicolete Gray here misreads (as she does elsewhere) the signature as "Dafyd": in point of fact, Jones used the Old English symbol for the dental fricative th, ð ("eth") and not the dental d, whose sound would be wrong for the Welsh form of the name. For a fuller discussion, see Colin Wilcockson, "Notes on some Letters of David Jones," Agenda, XIV (1976), pp. 85-86, footnote 10; reprinted in David Jones: Letters to William Hayward, p. 77. 19. Camden, Remains Concerning Britain, p. 101. 20. The God of Love has a squire who holds, in his right hand, five virtuous arrows and, in his left, five evil arrows. Beauty is the first of the good arrows. 21. Jones made spelling errors from time to time: here the Latin devina (for divina), and nehil (for nihil). 22. Thomas Dilworth, The Shape of Meaning in the Poetry of David Jones (Toronto: University of Toronto Press, 1988), p. 4.